It’s less than a week until Halloween, and I have no idea where the month of October went. Although here in central New York we have already had snow, the leaves are still colorful on the trees—I think this is the latest it’s happened in the five autumns that I’ve lived here. I’m trying to fully embrace the fall spirit with the little free time that I have had lately. Still, I haven’t figured out my Halloween costume yet! (Do you have any suggestions? In the past few years, I’ve gone as such sundry costumes as Carmen Sandiego, Rosie the Riveter, and a salad.) 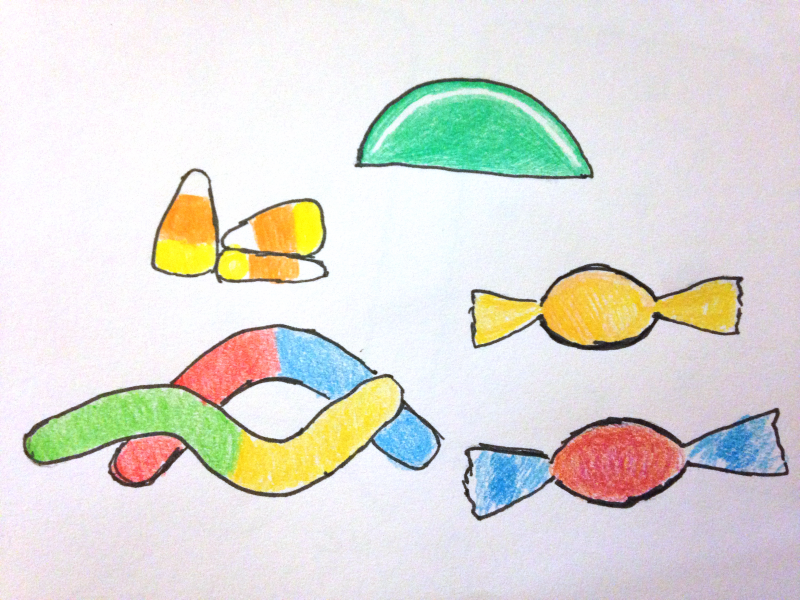 To hopefully help inspire myself, today’s post is going to be on sugar candies. If you ignore chocolates, candies pretty much all start out as a simple syrup, or, in other words, a mixture of sugar and water: it’s just what you do with that sugar and water mixture that helps to turn it into all the different varieties. Maybe you’ve tried making candy or fudge or caramel before, or maybe not (I haven’t done much! ), but you may be aware that the temperature to which you heat the candy will affect the final form it takes. All candy is heated at least to the boiling point of water: 212°F or 100°C. The addition of all the sugar, however, actually changes the boiling point of water, making it boil at higher temperatures. This same effect is why we use salt on the roads or sidewalks to melt ice, or to keep the roads from freezing in the first place—the freezing point of the water is lowered. (For any scientists or chemists reading this, you may remember this as colligative properties.) The degree to which the boiling point is affected is dependent on the concentration of the sugar in the solution. Intuitively, it makes sense that the softer or runnier a candy is, the more water it has in it, ranging from about 85% sugar in a soft candy like a fudge, all the way up to 99% sugar in hard candies like lollipops or toffee. The amount of water in a candy isn’t the only factor that affects its properties, however. Some candies are a heterogeneous mixture, composed of an amorphous part (where there arrangement and order of the molecules is random), and a part with tiny sugar crystals. Not all candies will have these crystals—in fact the really smooth, chewy ones won’t—but those that do can have varying levels of crystals, which affects the texture of the final candy. The more sugar crystals in a candy, the less chewy and elastic it is. For example, fudge, which breaks apart if you were to try to bend it, is roughly 30-40% sugar crystals, whereas a runnier caramel may be around 10%. Crystal growth in these warm solutions typically doesn’t happen spontaneously. The growth is similar to boiling—if you have ever heated water in the microwave in a new mug or measuring cup and noticed that it didn’t boil, at least until you put a tea bag or something in it, you will then recognize the importance of “seed crystals” (because they start the growth of other crystals), which is the role of a tea bag in this case. Scratches or imperfections in older cookware can also do this, as well as small dust particles, tiny air bubbles, or perhaps crystallized bits of sugar on the spoon you use to stir it. Ideally, you want to be able to control the crystal size, which means controlling the conditions under which they first nucleate, or start growing. If you introduce seed crystals when the syrup is hot, large crystals can grow. All the molecules in the syrup will have lots of energy to move around, so they’ll encounter the seed crystals quickly. This is sort of counter-acted by those same energetic molecules knocking around the seed crystals, to disassemble or dissolve them. In this same way, stirring the solution keeps crystals small. 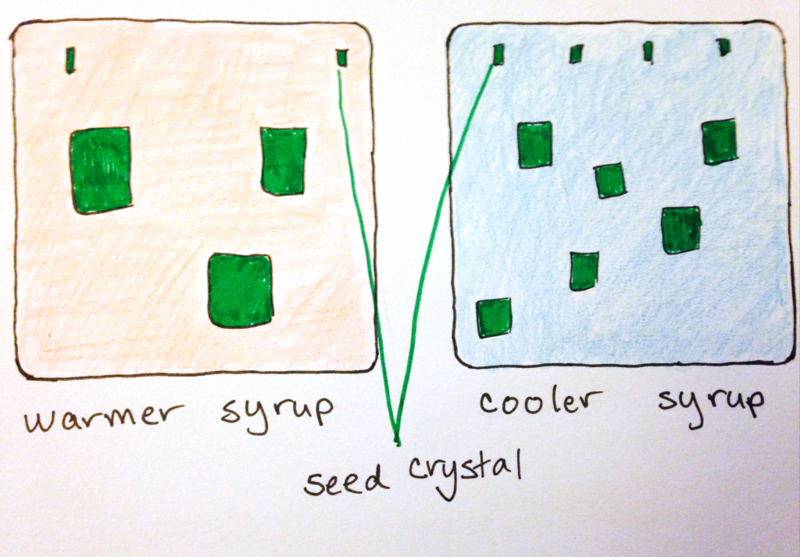 In a cooler syrup, the molecules will have less energy, and so fewer of them will “find” the seed crystal to also crystallize. You can also make sure that you control the crystallization by making sure the spoon you use doesn’t dry out or end up with dried bits of sugar on it. 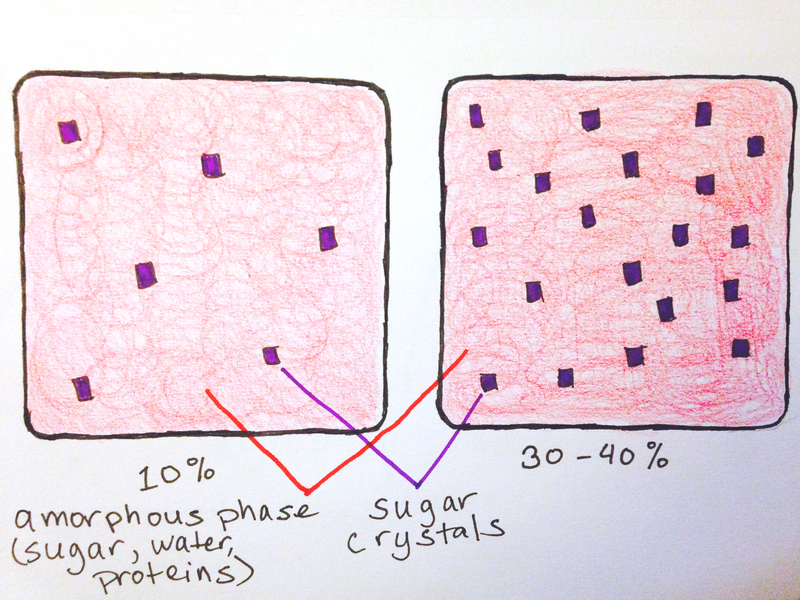 Beyond the crystal size and percentage of water, other additives can also affect the properties of the resulting candy. Milk, in particular, has components that affect the properties of candy. It has two main proteins: casein and whey. Casein is a stretchy protein and gives chewiness to candy, and whey contributes brown color. The proteins also help to emulsify the fat droplets from the milk into the syrup, which makes the overall candy smoother. Chewy caramels are chewy and brown because of the addition of milk (and not because they reach the brown caramel stage of candy production). Gummy candies use the addition of gelling agents, but those will need to be the topic of a future post, because I’m running very long here already! Suffice it to say that there is a lot more that can be said about candy. “Halloween Candy Chemistry: Caramels, Gummies, Jellies, and Candy Corn”, Rich Hartel, Silvana Martini, American Chemical Society webinar, 8 Oct 2015.